One of my all time favourite games is Crystal Castles by Atari. As i couldnt afford a dedicated cabinet (Update), i decided to go for a pcb and convert it to play in one of my Jamma cabs. This isnt as easy as it sounds, so i thought i would put a page on my site showing how i did it. i will not be held responcible for any mistakes/damage done to your pcb's or cabinets !! 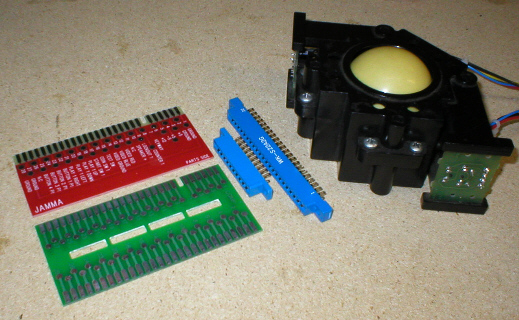 1) A trackball, preferably an Atari one and one that will fit in your Jamma control panel. 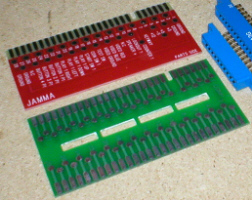 3) A 28 way Jamma finger board. 5) Edge connectors, a 2 x 10 way and a 2 x 22 way. 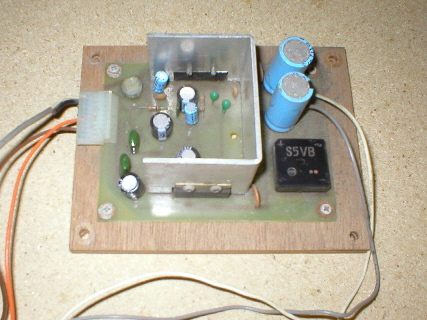 7) A small 12v Amp. Well i like to start with the Adapter itself first. As you can see i have 2 different types of finger board available to me (pic on left), which means i can make 2 different styles of adapter, but they both do the same job. Looking at the pic on right, you will see that using the red single sided type of finger board, gives you a loose flexible wire type set up, or using the green double sided type gives you a neat and compact set up. For making the Crystal Castles adapter i am going to use the green compact style set up. Taking the 2 x 22 way edge con (available here) you will need to add elongated blobs of solder to all the pins on both sides pic on left, then take the green finger board (available here) and add elongated blobs of solder to the strips along the edge on both sides. This is the edge without the keyway / notch. pic on right. 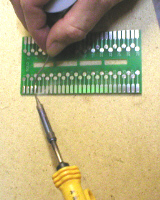 Once you have added all the solder blobs, slide the green finger board down the middle of the edge connector between the pins and line the pins up with the strips so that you are almost central, you should have 3 strips too many one end and 2 strips too many the other end on the finger board, now using a flat bladed screwdriver press each pin down onto the strip underneath it and reheat the solder with the iron and let it cool to form a joint pic on left. 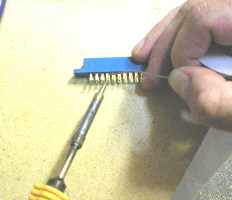 Once you have soldered all the pins the finger board should be solidly connected the the edge connector pic on right. Now that we have the basis for an adapter we need to add the relative wires for the game power, colours, sound and controls. These are known as the game board pcb pinouts, here i have listed the large connector pinouts*, part side (or component) and solder side. I have taken these straight from the Atari manual for this game. Some of the pinouts on the pcb we will not need to use as these relate to Atari's ARII audio regulator pcb and concern sensing circuits. Also the pcb uses a 10.3v+ but as its very close to 12v+ we can get away with using the 12v+ from a Jamma p.s.u. for this purpose. 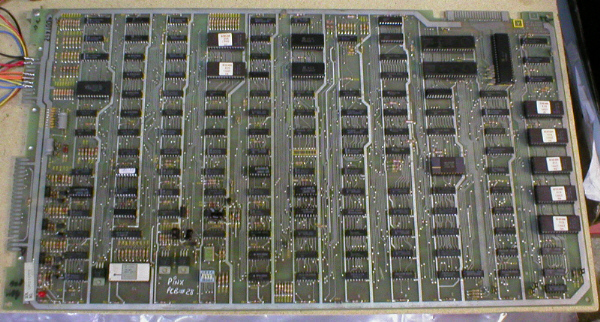 Using the standard Jamma pinout below make the corresponding links from Crystal Castels to Jamma. 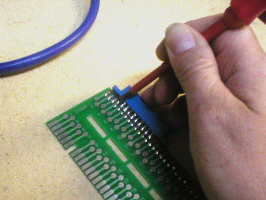 * The small connector pin outs will be dealt with in page 2 . We will not be using all the pinouts, just the ones in Red. Do not bother making the links for sound yet, as this will be dealt with in page 2. Black = for all Grounds (GND) inc video Ground. Red = For 12v+, 5v+ and video Red. Blue = For Video Blue. Green = For Video Green. Yellow = For Video Sync. Regular twin core speaker wire. Click magic hat for page 2.